Looking pretty good to be 90 years old. Him. Not me. I often can’t believe I get paid to do what I do. I work for the Education department at our zoo, which means I get to play with kids and animals. Even a bad day where I work beats the stuffings out of a good day just about anywhere else. And in early August, it gets even better. Last week, our ZooCamp hosted Open Doors, an organization for children with disabilities and their families. This is the second year we’ve been able to offer the camp, and this year we pulled out all the stops. I don’t aim for this camp to be educational so much as experiential, and I looked for every hands-on opportunity we could get. I wanted the kids to see, touch, hear, even smell as many unique things as possible. We were aiming for a total sensory experience, and boy did we get it! I am so proud of our zoo. Every department who offered our kids behind-the-scenes tours or keeper chats went above and beyond the call of duty. The camels are a special favorite, and though we didn’t ride this year, we were given bags of sweet feed to offer them. When Brian the camel “wrangler” saw the sandwich bag of camel food I was trying to divide among 11 campers and their peer buddies, he brought out a bucket of the stuff. The kids dipped their hands in the bucket again and again, delighting in Bernice the bactrian’s slobbery kisses. 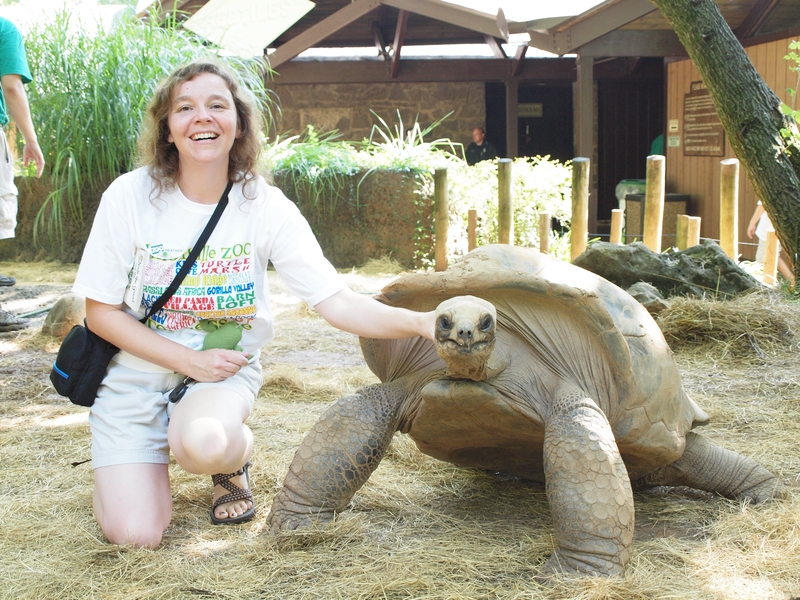 When we went to Herpetology, campers got up close and personal with our ancient Aldabra tortoises. Big Al is somewhere in the neighborhood of 150 years old, and the kids were amazed to pet a critter that’s older even than their parents (gasp!). The keepers even brought out watermelon to share with the old guys, and we got to watch Al and Tex devour their favorite treat. The Encounters Village, which provides hands-on opportunities to all zoo visitors, kept a running list of what the campers had already seen. They kept up a steady rotation of program animals so that there was always a different species of program animal to touch and new biofacts to see. The best part of the week was the campers themselves. Most of them were returnees from last year’s extravaganza, and seeing the progress they have made over the last year was amazing. One fellow managed to sit next to a play yard full of guinea pigs without reaching over to touch one until he was given the go-ahead from the animal handler. That’s a HUGE success for him! And there are no quiet moments. These kids who tend to say very little under normal circumstances never stopped asking questions. Many of the campers fall somewhere on the autism spectrum, and to see each and every one of them engaged on some level was truly awe-inspiring. What a difference animals can make in the lives of these special kids! My biggest challenge now is trying to come up with new stuff for next year. This year’s camp will be hard to top, but I am sure going to try!